Intersections -- Poetry with Mathematics: Zero is three! The countess cried, "You dare!" The count, "I dare." The countess struck him on the head. There resulted a cataclysm registered in the Bible under the formula H.2.O.C.A.B.L. New islands surged from the sea. Mountains crumbled. Waves flooded the continents and reshaped them. The poles inverted their axis. And it wasn't the countess's fault. She had forgotten she was a number and was skewing the angel's calculations as he bent over his desk. What could the countess do? Poor thing! And the count, that victim. And the world, the great world that had not expected the countess to change her cycle, since she was rich, elegant and played cards. Her husband played the horses and golf. Who could imagine the fallout from this domestic scene. Who? Other than the Great Bear that thought itself small, and the triangle that thought it was an oval, and the straight line that thought it was cured, and the zero, which proclaimed: I am the number three. 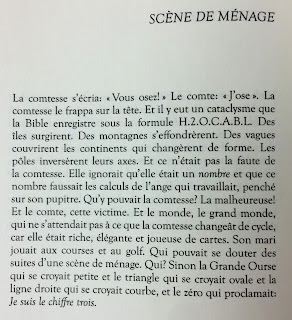 Notes from the translator: A scene de ménage, domestic scene, also means a marital spat. 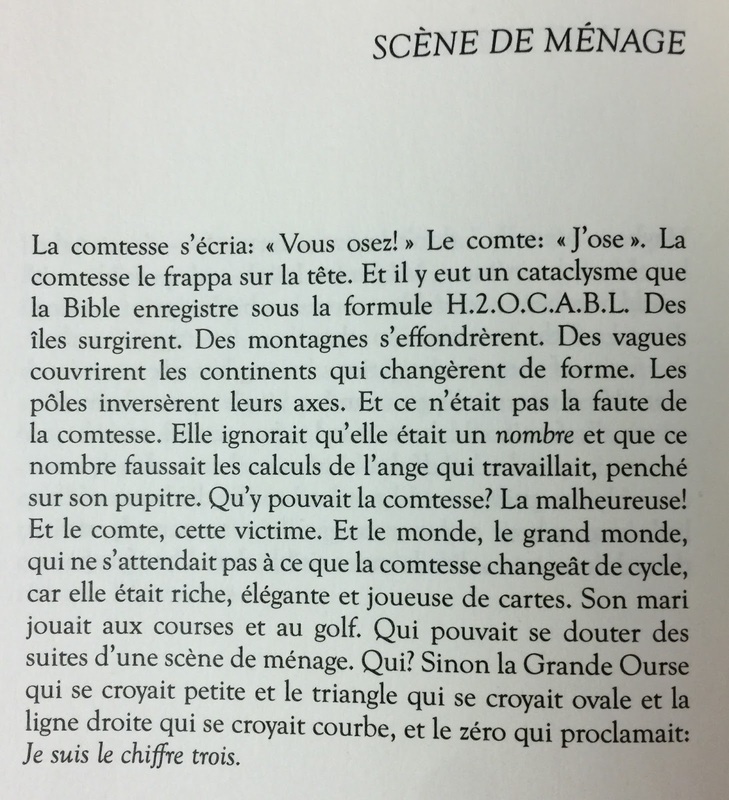 Some wordplay: H.2.O.C.A.B.L., when pronounced in French, sounds like "A(r)che d'eau, c'est Abel": water arc or Noah's arc, it's Able (not Noah). The number 3 represents the Trinity: a sort of origin story. Several more translations from Grace Notes may be found here at Willis' webpage. Selections from her Graffiti Calculus are available here. The French original for "Domestic Scene."